The ultimate reward for a speech-language pathologist is to break down the physical and cognitive barriers of communication. 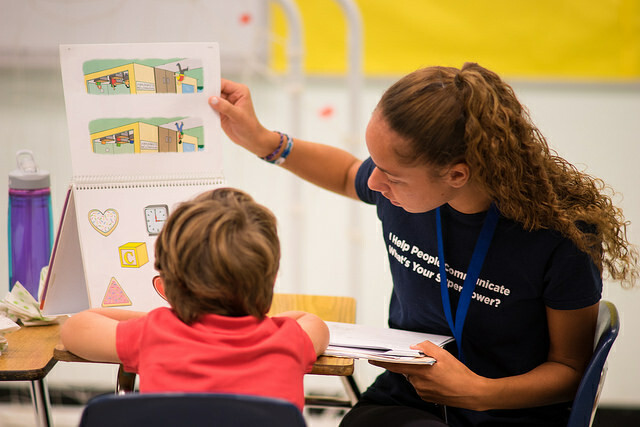 The Master of Science in Speech-Language Pathology (MS-SLP) at FIU prepares future practitioners through the application of evidence-based practice, technology, real-world experience, and cultural and linguistic diversity. Bilingual competency will be a critical proficiency as our society’s minority populations continue to grow. FIU’s Department of Communication Sciences & Disorders is committed to bilingual instruction, patient care and research that reflects the evolving skills needed for our profession to keep pace with culture. It’s why our graduates excel and one of the many reasons our master’s degree and post-baccalaureate Graduate Certification program stand out above the rest. As one of the six departments of the Nicole Wertheim College of Nursing & Health Sciences, FIU Communication Sciences & Disorders promotes effective interprofessional collaboration across fields, advanced research in healthcare delivery and evidence-based practice, as well as significant engagement with communities and partners around the world. The Master of Science in Speech-Language Pathology (MS-SLP) at Florida International University is accredited by the Council on Academic Accreditation in Audiology and Speech-Language Pathology (CAA) of the American Speech-Language-Hearing Association | 2200 Research Boulevard #310, Rockville, Maryland 20850 | 800-498-2071 or 301-296-5700. The Florida Board of Regents approved establishment of the Master’s program in Speech-Language Pathology (MS-SLP) on February 24, 2000. The MS-SLP program was initially granted candidacy for accreditation by the Council on Academic Accreditation (CAA) in Audiology and Speech-Language Pathology in Spring 2004 and received initial CAA accreditation in Spring 2009. The MS-SLP program was re-accredited in Fall 2016 for 8 years through Fall 2024. Our distinct emphasis on Cultural and Linguistic Diversity (CLD) and effective bilingual interventions prepares you as a practitioner to address the communication disorder needs of culturally and linguistically diverse communities. Students benefit from the infusion of CLD throughout the curriculum, which focuses on English/Spanish and English/Haitian-Creole bilingualism. CLD coursework is supplemented by clinical experiences and research in the department’s Communication Skills Lab and with the community at large to develop and promote bilingual treatments.